We have experienced the frowning providence of the Lord in the departures from Gaborone church. Three members have left because of moving to another town. We have continued to witness around our church and in the colleges and there is fruit, for which we are grateful to God. In recent months we have had two couples join our church. When people move out and a few others come in, we are always busy with discipleship. We currently have five men being discipled as possible future elders of Central Baptist (photo below). There is yet a lot they have to be learning alongside their secular jobs. Pastor Michael Legodi has settled in and the church has had 4 people join the membership through baptism. The church is organising itself through discipling the new members and regular attenders on the basic steps of Christianity. In the last six months, we have seen six new people become consistent to the services of the church. Pastor Legodi is already mentoring two young men, one of whom is now on internship at Kabwata Baptist Church. 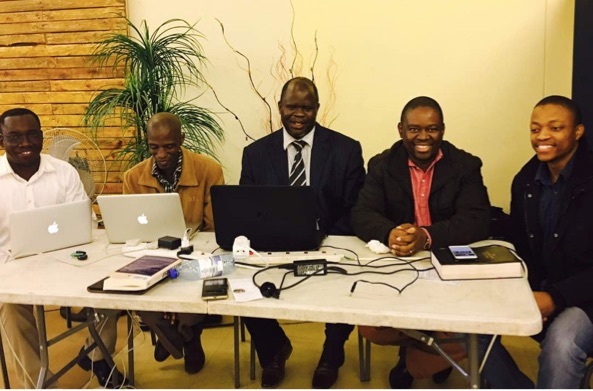 We recently held our Fifth Reformed Family Conference, led by Dr. Conrad Mbewe. It was a blissful time as he masterfully took us through the book of Romans. We really praise God for the opportunity of this conference.